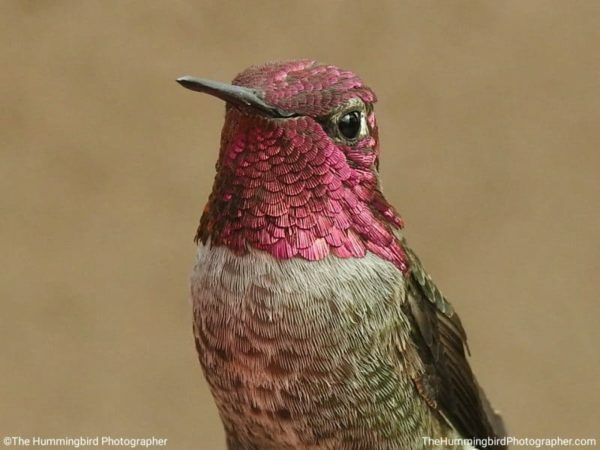 Want to attract hummingbirds to your garden? 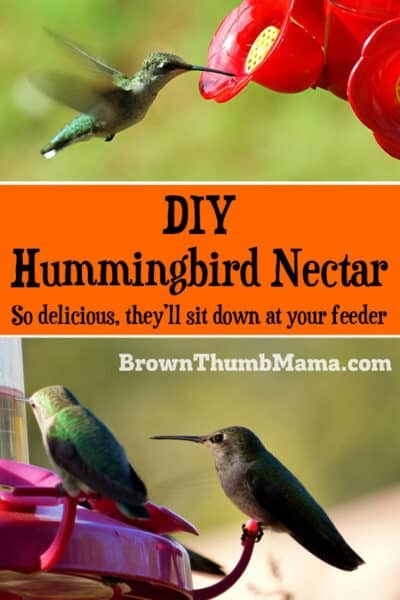 Make this easy hummingbird food and enjoy watching them fly around like little jewels in the sun. These amazing photos are courtesy of Meagan at TheHummingbirdPhotographer.com. Our family loves feeding and watching the birds in our backyard. Our birdbath and seed feeder have lots of guests all season long, but my absolute favorites are the hummingbirds. Here in Sacramento we mostly see Anna’s Hummingbirds. They love to drink from my fuschias and the neighbor’s trumpetvine. Since the males like to fight over the flowers, I put a hummingbird feeder right outside my kitchen window so they have an alternative dining area. This also gives them a constant food supply. The best food for hummers is flower nectar, of course. 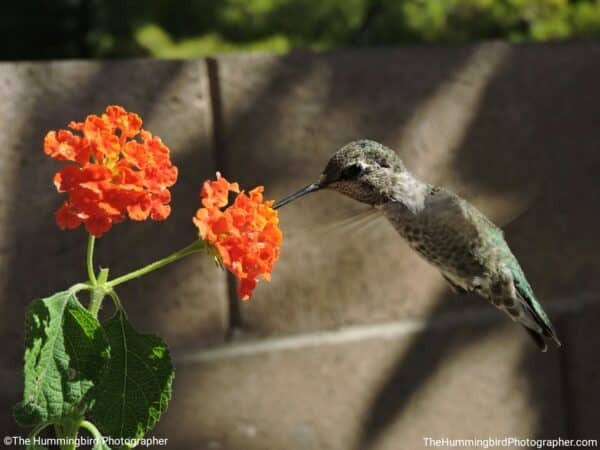 There are several flowering plants that hummingbirds love, and it’s easy to plant a hummingbird and butterfly garden for them. But if you don’t want to change up your garden, it’s easy to make hummingbird food. Hummingbird feeder: you want one that’s easy to fill and clean. 1 cup measuring cup: to measure the sugar and water. Large mixing bowl with pour spout: the pour spout makes it easy to fill your hummingbird feeder. Funnel: if you don’t have a mixing bowl with a pour spout. Mix 1 cup plain white sugar with 4 cups boiling water. Stir carefully until the sugar is dissolved. Do not add food coloring! 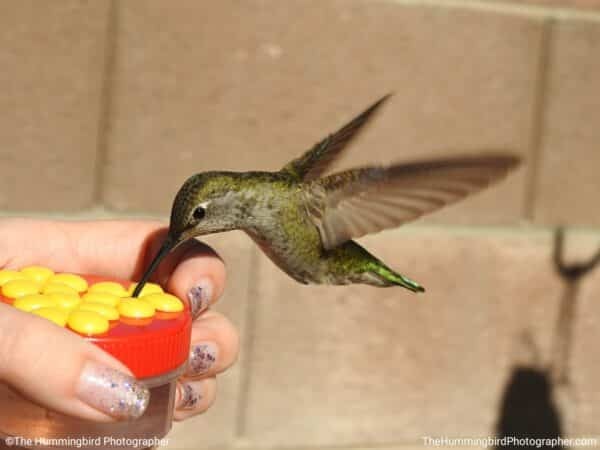 Allow the hummingbird food to cool completely and then put it into a clean, dry hummingbird feeder. Read my reviews to find the best hummingbird feeder. Keep the ratio exactly as listed. If you dilute the solution with more water, they’ll have to drink too much and won’t get enough nutrients. Only use plain white granulated sugar. Don’t use brown sugar, agave nectar, honey–which can kill hummingbirds–or powdered sugar, which contains cornstarch. Don’t add any food coloring to the water. A good hummingbird feeder has plenty of color to attract them, and the birds can’t process all the chemicals in the food coloring. Not all hummers migrate! You can keep your feeder out all year as long as you keep it full and clean. Place your feeder out in the open, out of reach of Neighbor Kitty. If ants start invading the feeder, put some Vaseline in a ring on the pole or on the feeder itself. It’s like a giant oil slick that keeps them from the liquid. Or you can use this clever gadget called an ant moat for your hummingbird feeder. Change the solution and wash the feeder every 2-3 days, more often if it’s hot. Be sure and wash the feeder every time, even if they’ve drained it dry. Our hummers love to drink from our feeder, and it’s great to watch them as I’m washing a pile of dirty dishes. It sure beats thinking about all the other chores that I’m not doing. Sometimes I swear I can watch the water level go down as they sit there and slurp! Do you feed the hummingbirds? What type do you have in your garden? Mix sugar and water in a large mixing bowl. Stir gently until the sugar is dissolved. 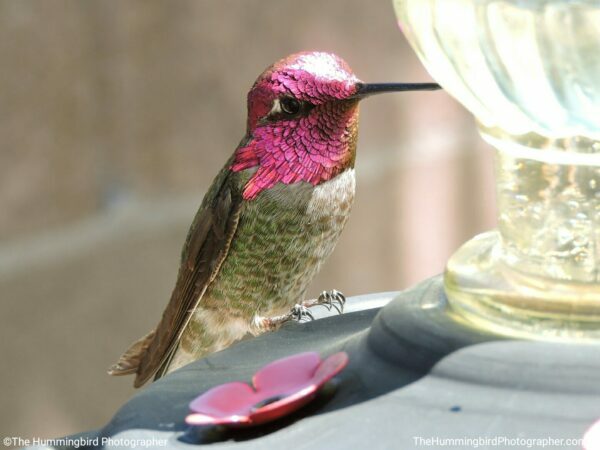 Allow the hummingbird nectar to cool completely and then put it into a clean, dry hummingbird feeder. 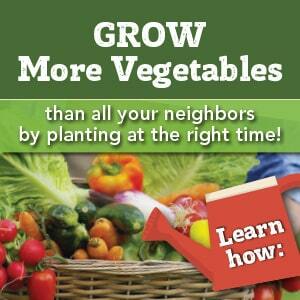 Subscribe to my weekly newsletter for gardening and DIY tips! Love this post? Click the picture to Pin it! Such great tips! I have been wanting a feeder but hate the ingredients in what they sell at the store. Ill definitely get one and make this. Thanks for sharing on Natural Living Monday! This was a very informative post on hummingbirds. I just love to watch them. I didn’t realize you can leave the feeder out all year round. Thank you for sharing with the Clever Chicks Blog Hop this week; I hope you’ll join us again! I just put up a feeder this morning to supplement the trumpet vine and butterfly bush. Within the next couple of weeks the birds will be heading south and the “juice” can help them on their way. I have two feeders hanging off my deck and get great pleasure watching them but this year i have one hummer that chases others off. What do I do ? They can get pretty territorial! I’ve had success with hanging the second feeder quite a ways away (maybe even in the front yard). Most hummers’ territory is 1/4 acre, so you might have to hang it next door. ;o) Good luck! 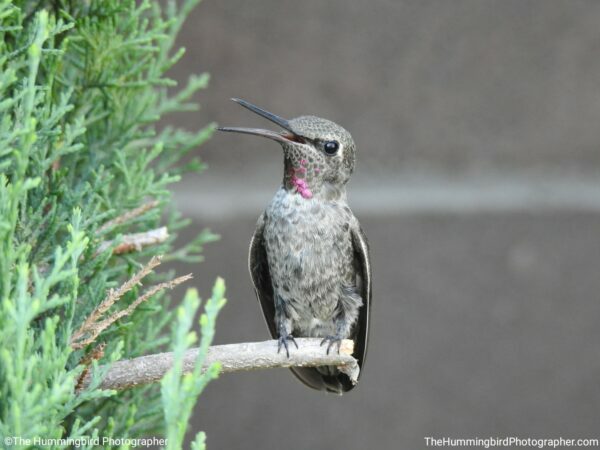 We have a place where we go in Bear Lake to see hummingbirds. This would be perfect. I have mad hummingbird food before, but haven’t always boiled it. I guess it is important to dissolve the sugar and kill any bacteria. Thanks! 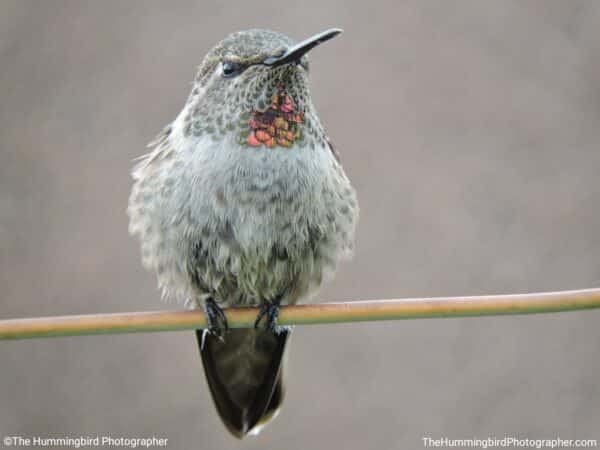 My husband calls it hummingbird Crack….I use your same recipe and the Anna’s hummingbirds line up for it…I can have 5-6 birds at a time! The neighbors probably wonder why their bids suddenly ignore the red processed fluid stuff….once I put mine up! I’ve done the Vaseline and it worked the first time and then after that it didn’t do anything. Not sure why but I did keep adding more Vaseline but they just kept going up. I’ve been using this recipe for years and my hummers will actually hover at my sliding door and “talk” if the feeders are empty. My feeders have a water mote at the top to keep ants away. After hanging your feeder just fill the water mote with plain tape water and that will keep them away but the water evaporates fast because it’s such a small amount so it’ll have to be filled more frequently than the feeder itself. My feeders stay busy and they love this recipe, it’s a good one! Don’t put vaseline or any oil products on the feeder or any hanger. Just make an ANT MOAT or purchase one, less than $5.00. Birds cannot wash off the oil as there is no soap in nature for them and they only moult once a year. They need healthy feathering. Can organic cane sugar be used?? I have 3-4 hummingbirds and love them dearly! But I have also bees that will chase the hummer away! What can I do about the bees? How long can you keep the refrigerated leftover of the hummingbird food? Thanks for the easy recipe, I’ll be making some of this tomorrow, I have this same red plastic feeder..I was just wondering how you clean the feeder. Do you use soapy water, or just rinse with plain hot water? Am curious – I am in the Sacramento area as well. I would like to plant some bushes that attract hummingbirds. Any recommendations? The base opens up, and I hand wash with warm soapy water. I have a serious bee problem. I have moved my feeder several time and the keep coming back. What can I do? I just started noticing a hummingbird coming around the past few days and didn’t think anything about it. But then I got to looking around the house to figure out just what the gadget was the he kept going to was and found out that it was a feeder. I have never been big on birds or their habits but I found it amazing that he kept showing up at the same time the past few days and flew off because the thing was empty. So, I looked up a recipe for the nectar to be put in the feed and come this time tomorrow…my little guy will be happy. I hope.